PYM delegation gather in South Africa, 2019. Palestinian youth are intent on reviving an international Palestinian liberation project. 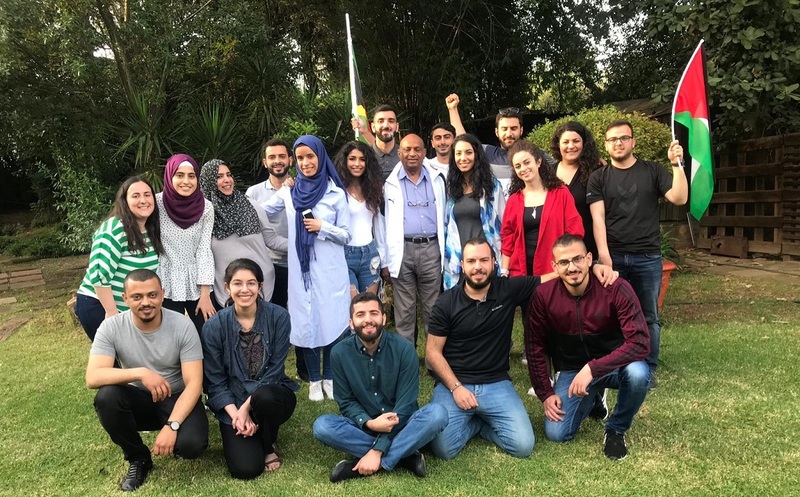 From April 1 to April 11, a group of Palestinian youth from around the world gathered in Johannesburg to discuss the Palestine struggle and the way forward for their people. They came together under the banner of the Palestinian Youth Movement (PYM), a transnational movement of young Palestinians. Three members of the delegation visited The Daily Vox: Ramah Awad from the PYM, who works for a Boycott, Divestment and Sanctions (BDS) organisation in the United States, Muna Alkurd, a media student from Jerusalem, and industrial sociology Masters student Abdallah Ghifat, currently studying in Cape Town. Awad, Alkurk, and Ghifat sat down with SHAAZIA EBRAHIM and FATIMA MOOSA to speak about the delegation and the future of Palestine. What is the Palestinian Youth Movement and what was the purpose behind the delegation to South Africa? Ramah Awad: The Palestinian Youth Movement has a long history of transnational convening and organising Palestinian youth. This project came out of wanting to revitalise that kind of transnational engagement, and at the same time seeing how the BDS movement has gained so much momentum, seeing how the apartheid framework has been used as a basis for BDS for Palestine. 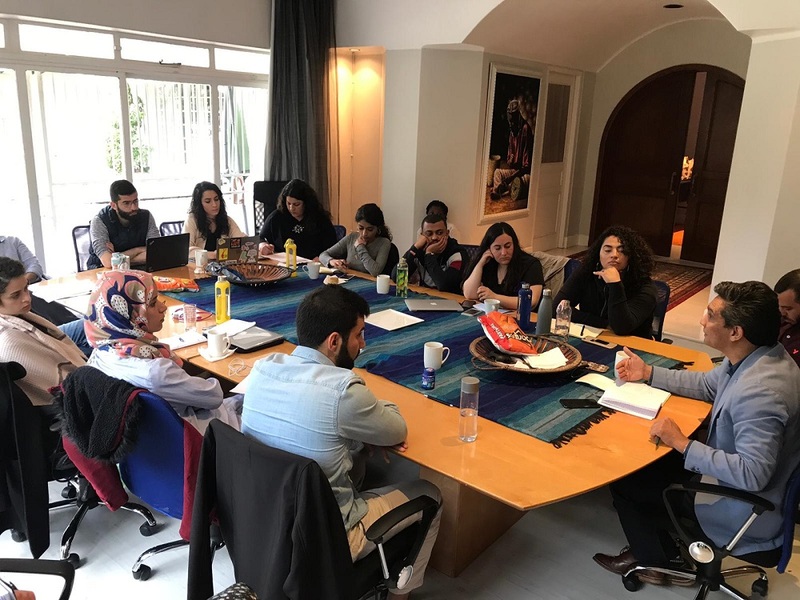 Palestinian Youth Movement (PYM) delegation of 2019 to South Africa engaged in discussion. Bringing that transantional mode of organising, along with this need to understand South Africa more deeply, we decided to bring together 20 Palestinian youth from all over the world. Many are living or working abroad but most of them have just come from Gaza, the West Bank, or refugee camps in Syria or Lebanon. We have a wide array of Palestinian experiences. For us, it was really important to engage and debate the conditions of our current national struggle. This was done against the backdrop of the South African apartheid struggle, both historically, and the ongoing issues. What has the delegation been like so far? 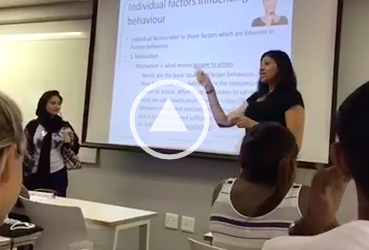 Do you see similarities in the South African context and the Palestinian context? Muna Alkurd: I find it interesting. I came with a vision of South Africa, and it totally changed when I came here. I’m really happy and excited but the most exciting part was meeting with Palestinian youth from all over the world. Abdallah Ghifat: I stayed in Cape Town for the past five or six years. I understand South Africa in a particular way. I studied politics and sociology and my focus was understanding South African history, struggles, structures and I interact with South Africans. I was excited to hear the perspective of other Palestinians from around the world and how they see South Africa. It gives me an indication of how we need to work with each other and what we need to learn from South Africa’s mistakes: the past, the transition process, and even the present. This experience is unique because it’s very rare to bring Palestinians to a politically neutral space that isn’t affiliated to any political faction to try and influence us into a particular direction. Awad: Who we have in the group represents many different backgrounds. We have different ideologies, different religious backgrounds, different class struggles, people from such different locales and experiencing such different aspects of how Zionism is operating globally. Despite that, we have so much in common in that feeling of displacement, Palestinian identity and nationalism. Whenever I’m in a space with so many Palestinians, it automatically feels like home. What are your perceptions of the relationship between South Africa and Palestine, and how can it be stronger? Awad: What I’m gathering is that BDS South Africa is very strong. What I’m gathering is that there’s a history of solidarity with Palestine. It starts with the ANC training with Palestine, there’s a long history of joint struggle. Ghifat: We as Palestinians, when we meet with South African groups, we say we as people have different ideas for Palestine than the Palestinian Alliance, for example. We are very critical of the PA. Side with the Palestinian people rather than the PA who are like for example, chiefs who led led the Bantustans during apartheid, who were agents and proxies for the apartheid government. In our case its the Israeli government. Awad: On a practical level, it’s about how politically active South Africans can really empower a new generation of leadership. It seems like PA is SA’s main source or reference point which, for me, is a problem because they came out of a project of Israel. That’s not going to lead us towards liberation. I would hope South Africa sees that and gives us space and resources to build a genuine national movement. What is the current status of the Palestinian liberation project? Awad: The PYM came after the Oslo Accords period, after the second Intifada (second Palestinian uprising against Israel). It came at a point where we felt like our national, international liberation project and movement was collapsing. For us as Palestinians, it’s important that we’re reviving that national liberation project. What that looks like is a question mark, but we don’t really have a current national liberation project. What we do have is a semi, barely sovereign national government, which if you ask most Palestian people don’t really represent their interests. Ghifat: We have a leadership crisis in Palestine. As we have been discussing, there is a consensus among youth structures that we have weak leadership and have to formulate a new phase of leadership. Programmes like this can help create a new generation of leadership. Networking with each other and sharing our experiences helps us build consensus of what we want as Palestinians for the future, for our liberation. What would you like South Africans to know about the Palestinian leadership crisis? Ghifat: It would be helpful if the South African government, through its rich experience, could help, and not just the government but the civil society organisations. If they can help us to do work within the structures of, for example, the PLO. We are not very much against the PLO, which was more representative of the interests of the Palestinian people. But we need to distinguish between the PLO and the PA which are quite different. We need to tell the PLO to go back to their roots as a true representative of the different Palestinian people. What does the international BDS movement mean for Palestinian liberation? Ghifat: As Palestinians, when we refer to BDS we mean the broader BDS movement which includes all the different Palestinian solidarity movements that fall under it. Awad: Given the collapse of the Palestinian Liberation Organisation and other populist structures, we’ve seen the rise of the BDS movement as the main way to mobilise people. That’s mainly through solidarity and leveraging power, from wherever you are all over the world, to further isolate Israel with boycotts, divestments, sanctions. That’s very important work. Sometimes I think that’s the last line we have, given the regional and international dynamics. If it wasn’t for BDS, there wouldn’t be a mechanism to hold Israel accountable to. On the flip side what’s lacking is a lack of Palestinian cohesion, organising and national strategy. I think it’s because of the collapse of unions, and institutions and popular committees existing all over the world. After the Oslo Accords, there hasn’t been something to reinvigorate it. We need BDS to pressure Israel into negotiation but the question of the leadership at the table is very troubling. BDS is important but we need to build a national movement alongside that. Ghifat: One of the things I notice as a Palestinian is that we don’t have a unified voice for BDS to take guidance from. I would encourage all the different movements to focus on Palestine and listen to the different voices in Palestine, not those who try to have a monopoly over the voices in Palestine or our supposed representatives according to all of us they hold no legitimacy. We need to question this idea of legitimacy and where does it come from. 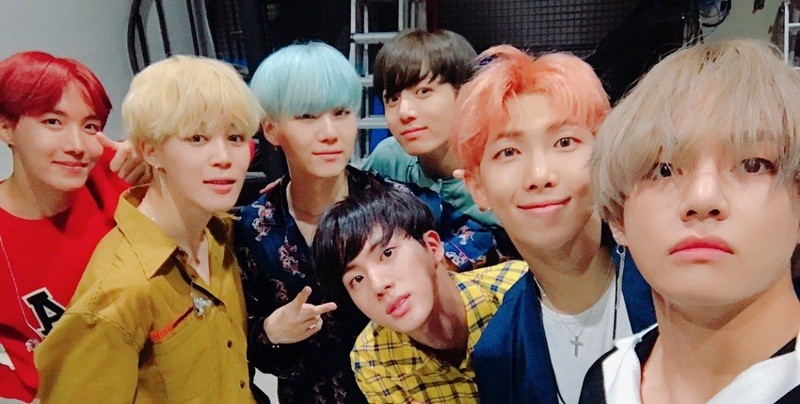 What did you want to achieve from this visit? Awad: I think the main learning points for me is the inner-workings and processes of creating a mass movement, the armed struggle, and the questions around how South Africa came to the Truth and Reconciliation Council. There are so many parallels and many lessons to learn. I would love us to come out of this with a short-term strategy, a medium-term strategy and a long-term strategy. In the short term we are saying engage and learn from South Africa and apply these lessons where you are organising. We want to see this as an educational experience. Longer term I want us to think about reviving the transnational element. It’s the middle part which I think we can flesh out more. We need to think about what Palestine needs and how can we join that. What path do you envision for the way forward? Ghifat: From our discussions there are two different opinions. We are trying to learn as we go which one should we go with. There are certain principles which we all agree on: like the right of return, that Palestine belongs to Palestinians from the river to the sea, and within Palestine we all agree that we will live within a social democratic state where is no discrimination. We are still debating on, and that’s where many of us disagree with South Africa which is, what is the fate of our colonisers – do we want to live with them as South Africans did or do we not want that. We told people we met with that your leadership not only failed you but failed us as Palestinians to give us a good example of how to negotiate a settlement. Now we are very reluctant to push for a settlement in the same way South Africa did. We need to understand the logic behind the experience of the negotiated settlement. Can you expand more on the point about what to do with the “colonisers”? Alkurk: On the topic of settlers and what do we with our colonisers – it’s important to note that we come from very different locations and experiences. For me, I can’t imagine living with a settler who stole my house and is now living there. When I see settlers they are my enemy. I can’t see them like a neighbour. But maybe other Palestinians can see settlers and Israelis as people that can live with us and it can be a peaceful country. For me, and other people from the West Bank in particular, we can’t imagine settlers like a neighbour and a friend. Ghifat: She is not speaking from a metaphorical point. The settlers are actually living in her house. Her grandmother’s house and her father’s house are next to each other. The settlers took over her father’s house. She is forced to live with her grandmother. They have to go through the same gate. They’ll go through the left side where her grandmother’s house is and the settler’s will go the right side where her father’s house is. They can’t imagine living with the settlers as equals. I myself have a long term vision where I see that maybe we need to make some compromises. I come from a specific area – the 48 Occupied Territories – where we do actually mix with the Israelis. It’s a different experience where we do interact sometimes with the oppressors. It’s almost like the relationship becomes normalised but not that it’s normal. There might be a room where we can understand living with. Maybe someone who is more affected – I’m not sure we can measure that – they blocked their minds and say we can’t live with their oppressors. We are trying to solve these debates.